Collins Easy Learning How to Use English not only explains what English words mean, but also provides information on how the words actually work. The entries are organized alphabetically so that they are easy to find, and each has a clear explanation of when and how to use the word. Each entry also includes examples from the Bank of English (R) corpus, which show how the words are really used in everyday English. 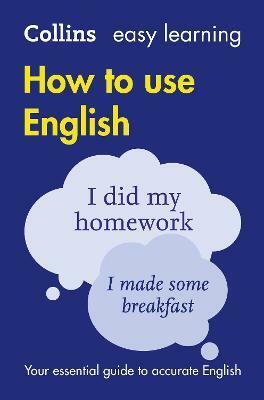 The title covers a range of different areas of the English language, to help learners use the language naturally and effectively. It provides clear information on easily confused words, words with similar meanings, and help with words that are often tricky for learners to understand. With additional information on American English, and warning notes highlighting particular problems, the Collins Easy Learning How to Use English is an indispensible tool for learning English today.